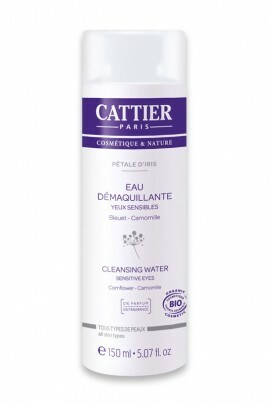 Cattier Organic Cleansing Water for Eyes "Pétale d'Iris" is specially formulated to remove makeup from the eyes without irritating the particularly fine and sensitive skin on the eyelids and eye contour. Enriched with organic camomile and cornflower waters, Cattier Organic Cleansing Water for Eyes "Pétale d'Iris" soothes, softens and decongests. Extremely refreshing, its soft and non-irritant formula is suitable for sensitive eyes. Pour a few drops of Cattier Organic Cleansing Water for Eyes "Pétale d'Iris" on a piece of cotton wool and delicately remove makeup from the eyelids followed by the lashes. Organic Camomila flower water, Organic Cornflower flower water.